And ever since she let go of the past, (s)he found her life was beginning. a flat chest and some muscles. or hair to grow all over me. teenage boy, but not a real one. Boi was originally aimed to relate the living conditions of individuals in countries where political and religion issues hamper everyday life. But Boi became the story of an inner struggle, a quest for who one really is. Boi is the story of a girl who wanted to be boy. Boi keeps tracks of Nitzan's life and body changes, following her through her journey all over the world. But most important it shows us the surprisingly beautiful direction uncertain steps can take. Nitzan unveils who she really is: an amazingly attractive and vigorous young man. Throughout the film Nitzan is taking unconventional pictures of herself. The outstanding self-portraits are not only showing her gender transition but also acting as a symbol for the lonely, personal cause. 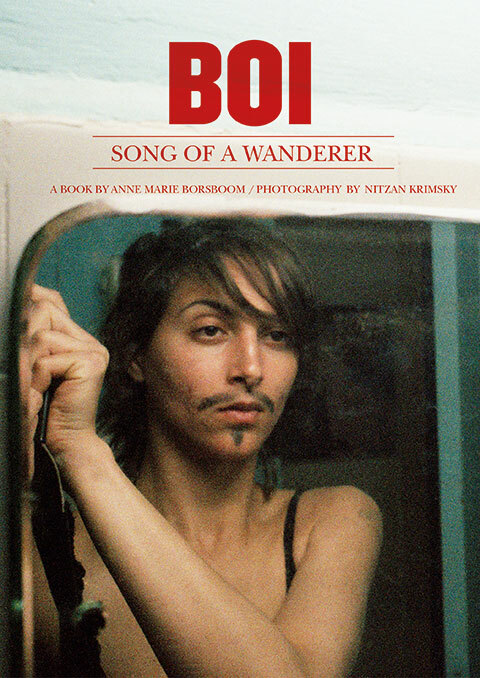 These self-portraits needed its own platform in the book we released in July 2014 with the same title BOI - song of a wanderer. World-famous Photography museum Foam in Amsterdam recognizing the artistic value of Nitzan's self-portraits, invites us to make a photo exhibition BOI. It took place in July-Aug 2014 and around 10.000 people got the chance to see the photos. Both the documentary and the book BOI, made by Anne Marie Borsboom, are the result of an ongoing experiment with the capacities of the photographic medium to document, communicate, construct identity and above all as a means that allows for imaginary and creating new realities. It is 2003. Nitzan, a highly intelligent, good-looking girl in her twenties, living in Tel Aviv, wants to escape the stress, terror and military draft in Israel and leaves for Tokyo to work in a nightclub. She hates the job but needs the money to keep on travelling. After Tokyo she lives in New York, Amsterdam and Milan. Sucked into a world of escapism and night life; time and again she tries to focus her energy but her restless soul isn't helping her much. One thing is a constant though, wherever she goes, she takes portraits of herself to keep up with her feelings. Finally in Milan she studies and works at a renowned institute of photography, and makes a great personal discovery, although many of her self-portraits already gave a hint: 'the girl with the moustache' decides to change her life. Now her identity is no longer something fixed, she feels like reborn and all her imbalances seem to vanish into thin air. As an amazingly attractive young man, he dates gay guys. New York is an eldorado for exploring both the gay world and his Jewish identity. And ever since she let go of the past, (s)he found her life was beginning. This quote from Virginia Woolf's novel Orlando holds true for Nitzan. He cherishes his first name, because the astrological meaning is: to die and be reborn. After following Nitzan for more than 12 years, the film went through a similar process of rebirth in 2014. Why does gender seems to be so fixed? Why isn't identity fluid? I was only twelve years old when I asked myself these questions for the first time. And I have not stopped questioning the gender subject since. It's woven as a main thread in all my movies. I consider it to be a true gift when someone opens their life to my camera and me. Not only for me being a filmmaker but also for me being a human being. And that's something I am thankful for. Thank you everyone for supporting our project on Kickstarter and VoorDeKunst. We are happy and grateful for your help. More info about the project?